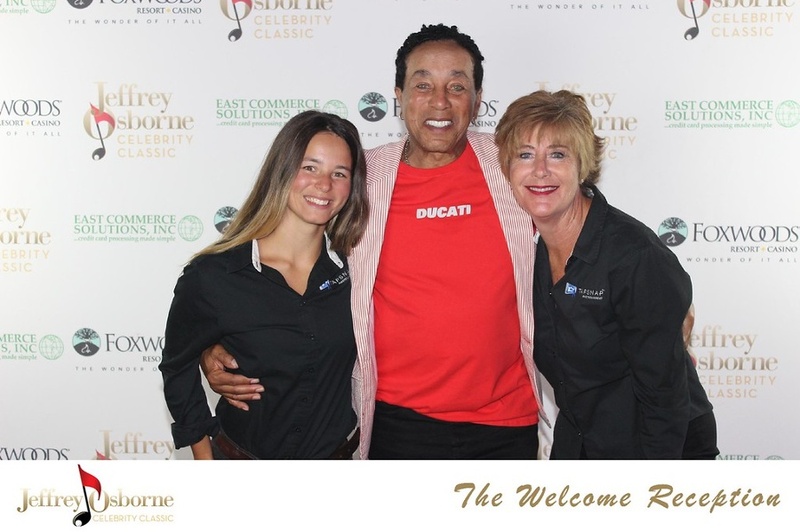 The primary mission of the Jeffrey Osborne Celebrity Classic is to benefit non-profit organizations who support a continued push for music and the arts to children and their families, as well as those who provide a safe-haven for families in need. The Classic also provides music and art-based scholarships, and a humanitarian award to deserving individuals and organizations. In his efforts to support these deserving organizations, Jeffrey Osborne has engaged some of the most successful names in the entertainment and sports industries for this 7th Annual Jeffrey Osborne Celebrity Classic event. Celebrities invited included event host Ice Cube, as well as Smokey Robinson, Sugar Ray Leonard, Javier Colon, Julius “Dr. J” Erving, Ozzie Smith, Rick Barry, Cedric the Entertainer, Chris Tucker, Eddie Levert, The O’Jays, Johnny Gill (New Edition), George Lopez, Doc Rivers, Eddie Murray, Jay Harris (from ESPN), and many more. Q: Can you please tell us how TapSnap was involved in the event? This was our second year servicing the two-night event. We provided photo booth entertainment for both the Welcome Reception and the Champions Awards Dinner/Gala (events held on two separate evenings). Q: Can you please share some event highlights with our readers? At The Welcome Reception, Jeffrey introduced his celebrity guests one-by-one, inviting them to join him on the stage while singing and grooving to music. Epic moments at the Welcome Reception included live music performed by Jeffrey Osborne, Smokey Robinson, Ice Cube, and Eddie Levert. Highlights were Smokey singing his classic "My Girl" song, Ice Cube rapping his famous song,"It Was A Good Day," and Eddie Levert (lead singer from The O'Jays) singing his famous "Love Train" song! Johnny Gill also performed his hit, "Rub You the Right Way" with Jeffrey Osborne, Eddie Levert, and Jon B. on background vocals. All of the celebrity guests sang along with them on stage, and the audience participated as well! Jon B. and Javier Colon performed at The Champions Awards Dinner/Gala. At one point during the Welcome Reception, several guests were lined up at the TapSnap photo booth to take a photo with Ice Cube. He was kind and engaging with all of the guests. George Lopez gave guests a good chuckle at the All-Star Comedy Explosion, and he snapped pictures with us at The Champions Awards Dinner/Gala. Q: Did you receive any feedback on the TapSnap photo booth experience? The celebrities were engaging with us, and we were privileged to have had the opportunity to be in some of their photos. Many remembered us from last year's festivities which was remarkable. Our clients, Terrell Osborne and Jeffrey Osborne, said they loved our energy and excitement with the guests. They treated us as an extension of their family - they were very warm, welcoming and kind. Genuinely appreciative and complimentary of our TapSnap services. Q: Why you think TapSnap is such a great addition to charity events such as this one? Besides increasing the fun entertainment factor at charity events, the sharing of branded photos on social media increases awareness for the cause which, ultimately, benefits the organization. The hope is to increase support from the community. It is a winning combination - the fun factor combined with brand awareness and reach! TapSnap is a great way to capture special memories and share them, and there were definitely a lot of memories made that night. Are you interested in adding a fun photo booth to your next charity event? Check your date and book now!